Propeller shafts. They’re probably not a make or break item on your average car buyer’s checklist these days, but the long absence of driven rear wheels from the Alfa Romeo brand seemed to coincide with a general decline in regard for the company’s offerings. 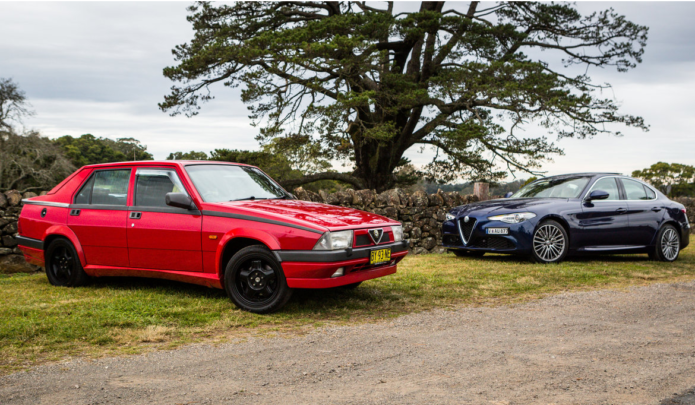 While the Fiat-engineered models sold as Alfa Romeos in Australia since the late ’90s – including the 156, 147, GTV and Mito – have attracted their share of followers, many lovers of the brand have been pining for a return of the feeling possessed only by cars designed by pre-Fiat Alfa Romeo; the feeling Alfas offered when the company made front-engine, rear-wheel drive cars. Well after 25 years, prop-shafts are again featured on Alfa Romeos, carbon-fibre ones at that. The Giulia, launched in 2016 as a five billion euro attempt to reinvigorate the brand and provide cars that live up to the legend built over 107 years, is now on offer to bring back those craving Alfa magic to the fold. It’s also here to draw in those born too recently to know what the fuss over the old models is about.